Cat Chat With Caren And Cody: Are we a nation of "Cat People" or "Dog People?" Join America's Pet Debate! Help Purina® Help U.S. Veterans! Are we a nation of "Cat People" or "Dog People?" Join America's Pet Debate! Help Purina® Help U.S. Veterans! Back when Zee & Zoey were conducting their Cat Ruler of the World Contest there was some barking going on about dogs. Who likes 'em, who doesn't and who just loves animals? From what I noticed in the comments, folks had LOTS to say! Well Cat People, now you can make your voices heard! HOT OFF THE PRESS! I was just sent information from my friends at Purina and they want YOUR help to end the age-old debate as to who is better? CATS Or DOGS? Check out the info that I just received! For every vote, Purina will donate $1, up to $100,000, to Pet Partners’ Veteran Programs. The donation will help fund Pet Partners pet therapy teams for U.S. veterans by providing the mental, physical and emotional support of cats and dogs through animal-assisted therapy. There are more than 22.7 million veterans in America today. The current national vote tally is 54% for Team Cat and 45% for Team Dog with a total of 47,923 votes. I was not compensated for this post. I am a member of the Purina Cat Blogger Panel and am given information that I may choose to share...or not. Not sure how this would work for us in Britain. However, the proceeds go to a cause that is dear to our hearts on a worldwide basis. I have forwarded your posting via social network sites and I hope that helps. Yes, vote fur sure, tis one good chance to voice your opinion! @Penny you are a complete sweetheart!! thank you for helping to spread the word! My trouble is I have too many American friends and I thought I was your neighbour. Haha!!! My vote is obvious. Does it matter where I live geographically? We are all of one people....CAT people. purrr.....meow! Yes ma'am! We are on our way! So, whaddya think? Do you think the Human and your Mommy might get to make a WORLD SERIES BET???? Do they has a BOTH option? cause we loves cats and dogs, why the Mom even loves horses, goats, sheep and........well you get the idea. YAY! Mom and I are gonna vote RIGHT NOW! Way cool....let's hear it for Purina and what a wonderful cause too. P.S. Chloe has a lot of purrsonalities, does each one count sepurrartely?? @Two French Bulldogs...love your style...Dakota feels the same! @McGuffy Ann, you can vote once a day for whomever you want! @Old Kitty we think so too! @Sammy YAY!! So glad you are voting and we agree about Purina! @Spitty...I think if the Tigers make it that far they will lose. Mom thinks they won't get there but for Dad's sake she hopes they do! @Priscilla OMC how I LOVED THAT! MOL! We think it is an even steven deal. They are both great animals and you should know that since you have one of each. We sure will go vote though. Please don't tell, but me went and used my US address tos vote! haza grate week oh end !! That was fun, but I had to push Mom's hand with my paw, to make sure that she voted right! Cats, all the way! 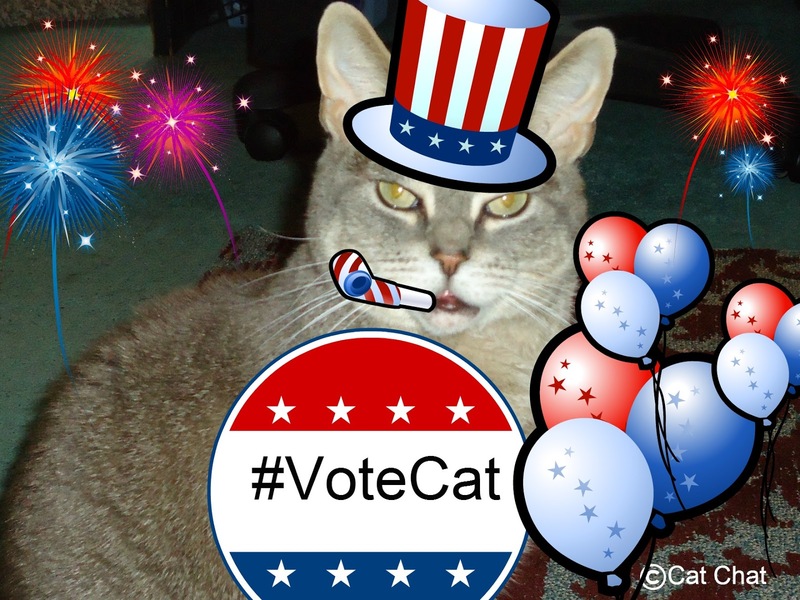 Oh we're soooooo voting CAT! @Keisha tell your "hoomin" she can...my mom is! You can vote once per day! @Bobo YAY for helping Mom! @da Tabbies we LOVE how you think! @Nellie my lips are sealed! @Marg you are absolutely right!! That is why Mom is voting back and forth! A great cause, a great vote! We love dogs but hey! We're a cat household! What a great way to raise money!! We know it's all in fun, but you are right, I think we sealed the deal at Zee & Zoey's that WE know how we are going to vote!! Sorry Dakota... will still LOVE you, but gotta go with the felines in this one!! Thanks for visiting us and letting us all now about this event! Of course Kitties will win! Can you guess which team we voted for??? Now if we could just figure out how to vote ten gagillion times a day! Cats are leading 54% to 46% !!! I'm off to vote now. I did put a photograph of shelter dogs on my blog today, but I don't want anybody to think I'm changing teams! Hey, Cody et al. Your Tigers play those Dam* Yankees today! And we go nose-to-nose with the Stoopy Card tomorrow. Whaddya think: Tigers v. Giants in the series???? My kitty brats insist I vote "cat"
Yep, the Yankees aren't even gonna put up a fight. Good luck in the WS. @Cathy Keisha...well, hoping we get there. I have to say I was STUNNED at the lack of cheering from the NY fans until the 9th inning. They were dead!! Oakland was sooo friggin loud! Hoping we get to the WS but I have my doubts! @Maggie "cats are where it's at!!" @spitty I wish but I have serious doubts about that! @Katie you can vote once a day....I know you secretly voted for DOGS....KIDDING! !